The first time I really consciously experienced gratitude in my life is when I became a yoga teacher. I can clearly remember feeling so overwhelmed at what had been given to me, it used to make me cry spontaneously for no reason. I had been taken out of a life that I didn’t want to live anymore and existence had given me this wonderful gift of teaching yoga. It is an emotion like no other that fills you from inside and gives you no choice but to share what has been given. It is an emotion that teaches you, that what you have is enough and creates a sense of contentment that vibrates through you as a powerful energy which is very grounding as it is humbling. Having just done a deep meditation retreat last month. It highlighted my intentions for the new year. I must find these within myself to be able to share them through what I do. And this insight I am truly grateful for. I’ve felt the community come together this year in a way I’ve not before. I’ve watched people process things and go through really difficult times… some are still going through them.. and I’ve witnessed them change and grow stronger. Its been beautiful to see how the yoga has helped and supported them though these intense times and grounded them through the things they needed to go through. Reflecting over the year there have been so many highs and so much to be grateful for. A massively positive start to the year with the January 30 day challenge and so many people took part – we started 67 and 48 of us completed – which was amazing and created a real buzz and such an uplifting energy in the studio. I’m so inspired and motivated by people’s commitment, discipline and dedication to their practice. We just get stronger as a collective!! Two incredible retreats. Our Kerala retreat last year was one of the best experiences of my life. It really showed me how special and important community is to the richness of life and our studio. I’d never been to Meribel before so going there for our summer retreat was a whole new experience for me.. and WOW.. the mountains blew my mind!. It showed me that being open to new experiences is what life’s all about. Our summer party in August which despite being torrential rain so many people made the effort to come to and have a drink, some food and conversation. Real generosity of spirit. Such kindness from Max & Mel for giving us their house for the second year in a row. Elizabeth introduced Kirtan for the first time and I was blown away by how much people embraced it and fully got into it!! For me that was totally unexpected.. I hadn’t imagined us doing it here. Its really special for me because I used to sing and do these chants with my mother when I was a boy.. so for me it keeps her presence alive. Watching Studio 2 grow and the classes take off has also been wicked. What started as a means to create a bit more revenue to help with our rent increase has brought in a new group of regulars who love to sweat & get their muscles burning. Its brilliant that we can offer more variety, to our members especially, and also to our beginners so they have classes to be able to transition more softly into hot yoga. 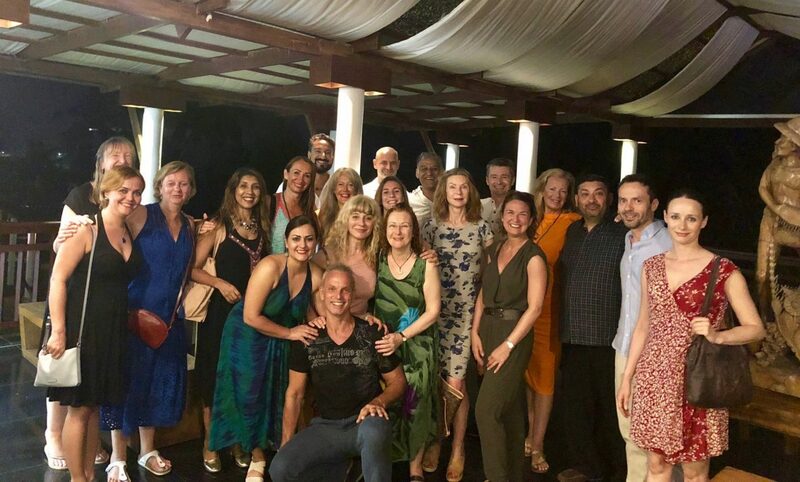 The thing I’m most grateful for is that we get to do this incredible, healing, self – nourishing, consciousness building thing called yoga together. That we are fortunate to have the means. That the studio has survived and thrived this year. That people are so generous with each other and that we can share our energy to support each other. That we can grow through this practice. That whatever is happening in our lives we can come back onto our mat and process it and just connect with our breath and be with ourselves. That we are doing a good thing for humanity by working on ourselves, working out our s#*t and becoming more peaceful and grounded, so we are less inflicting on others and ourselves. Here’s to a new year full of awareness, acceptance and abundance.